David has led Equilar since its inception to become one of the most respected and trusted names in the executive compensation industry. David has been recognized as one of the “100 Most Influential Players in Corporate Governance” by the National Association of Corporate Directors (NACD). David often speaks publicly on corporate governance and executive compensation matters, including events hosted by The Conference Board, Corporate Board Member, The HR Policy Association, NACD Directorship, NASDAQ OMX, NYSE Euronext, the Society of Corporate Secretaries and Governance Professionals and Stanford’s Directors’ College. Prior to founding Equilar, David was a Vice President in the Investment Banking Division of Donaldson, Lufkin and Jenrette, a global investment bank that has since merged with Credit Suisse. Prior to DLJ, David was a management consultant with Bain & Company and also Kenan Systems, a telecom billing software developer that was subsequently acquired by Lucent Technologies. 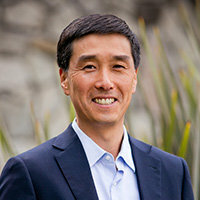 David is an advisory board member of the Wharton Center for Entrepreneurship, a Trustee of the Committee for Economic Development (CED), a director of the Asian Pacific Fund Community Foundation, a member of the Young Presidents’ Organization (YPO), and a founding member of the Council of Korean Americans (CKA). David earned his MBA from the Wharton School at the University of Pennsylvania and a Bachelors of Science with Honors in Systems Engineering from the University of Virginia.